Sigh - they said we were going camping but there was driving and more driving. Then Mum and then Dad would disappear into some washroom type place! Well, after some stops to find some new hardware and some maps (because Mum forgot to go to AMA) we are finally camping at a very nice campground on the Grande Prairie Regional College grounds. There is lots of birds to watch and trees that I think I can climb. Now this is camping. On our drive here we saw 2 deer – one running across the road and one having second thoughts. We got a bit of a late start by the time all the neighbours came by to say “ have a good trip; don't worry we will look after things”. Thank goodness for terrific neighbours. All is well, truck is running well. Trailer is a little bouncier so there is some re-organizing when we stop. I am sure there is something rustling in those bushes! We saw 2 Snow Geese flying north. We had a stopover in Dawson Creek. Here I am at MilePost 0. I really like to climb on things. Mum and Dad had lunch from the bakery. There was construction outside Fort St John on that very steep hill – Taylor Hill. Dad drove very well but Mum still had white knuckles but the time we made it to the bottom of the hill. We have come to realize if you see “chain on signs” that hill is going to be steep. It was a wonderful view but there was no way to stop and take a picture. We stopped for the night at the Pink Mountain resort. Sadly, The Pink Mountain resort does not quite live up to the hype in the Milepost mmm – it maybe what we can expect from here on in. PS: June 13 – the couple from Florida said the same thing – if this is the best campground on the Alaska highway then we are in trouble. 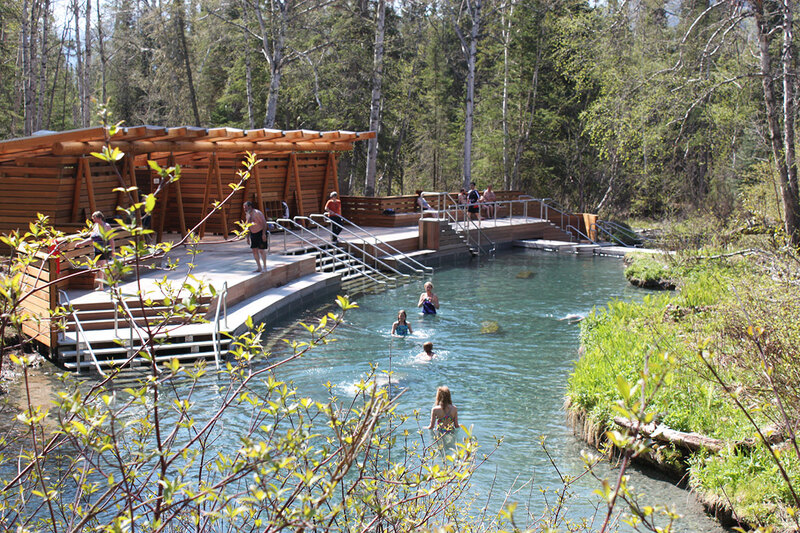 PPS: June 15 – when Dad was “lost” at Liard Hot springs he was talking to a guy with an r-pod. He did say that Pink Mountain had been quite nice until all the work camps moved in. We met Marshal – his was riding his motorcycle from somewhere in Alaska back to Nova Scotia. Although when we talked to him he was deciding whether to go south to Prince George and wait for his girlfriend or whether to go to Nova Scotia and ride back out with her when she retires. Sadly his bike tires were getting down to the the thread so I hope he made it to Fort St John OK. It was pouring rain when he left and it looked like the rain was going to travel with him. MMM what is in here? I haven't seen this space before. What! I am sure I heard a mouse. Didn't you hear a mouse? I had a little fun with Mum and Dad before we left Pink Mountain. My harness was not as snug as it should have been so I managed to squiggle out of it. I ran off towards the workmen – tail in the air, grinning over my shoulder. The workmen had a good chuckle watching Dad trying to catch me. It was good fun. We saw 2 coyotes, 2 bears, 3 moose and 1 bison. Let me tell you about the second bear. Dad couldn't get a good picture from inside the truck so he got out. He very carefully kept the truck between him It was patting the grass trying to scare up mice or ME! As it started getting closer I am not ashamed to admit I tried to make myself as small as possible. My ears went back and down and I executed the down periscope maneuver to get myself below the window. I was very quiet for the rest of the day! and the bear even though the bear was quite far away. It was interesting to watch from afar until the bear started moving towards the truck. It was rainy and Dad was playing tricks with those funny black arms on the window. I kept batting at them and still they wouldn't stay put. I even growled at them but still they kept flapping. Every time I thought I had them vanquished they would pop up again. Dad would giggle so I am sure he had something to do with it. We stopped at the Tetsa River lodge for cinnamon buns. There was a dog that seemed a little shy of me but the man and women running the bakery were very impressed by my tail. We also met another lady that had stayed at the same campground last night. She needed some cat love so I obliged. Mum and Dad got yummy cinnamon buns for tomorrow's breakfast. I get the same old cat food. 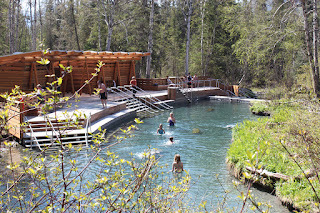 We are staying at Liard Lodge campground – nice and shady but the showers and laundry are not operational. That's where we saw the bison across the road. Doesn't it look shaggy – must be getting ready for summer. When it was getting dark I heard something in the bushes. I was going to check it out but Dad grappled me and put me in the trailer for safe keeping :). We are staying here for 2 nights – thank goodness we are finally camping. Today was a rest day. Dad and I napped before Mum and Dad went off to the hot springs. Dad said the water was really hot at the bottom of the picture. As the water flowed from the source the water got cooler. Mum and Dad thought it was very relaxing. Mum got caught up on her reading. She seemed content. field by our trailer last night so I was very happy about staying in the trailer. Once Mum and Dad got back from the hot spring Dad and I had another nap. After supper I got to kiss a moose (see picture). Not sure where the other half of the moose went – maybe I don't want to know. Today we saw 9 bison – 7 in one group and 2 laying by the side of the road. They were laying is some lovely beach sand – you can really tell this use to be an inland sea. We also saw 4 bears – 2 were crossing the road and 2 were grazing by the side of the road. I had to make myself as small as possible so they wouldn't see me. Dad saw a fox as well. There are supposed to be Caribou but we haven't seen them yet. Dad took some good pictures of the Liard River at Allen's Lookout. Legend has that the outlaws would watch for riverboats on the river so they could plan their attack. You'll have to go to the web pictures to see them – I was left in the trailer :(. We stopped in Watson Lake to see the signpost forest. It sure looked like I could climb some of those trees. We didn't stay very long because it was quite windy. Although, Dad did try to talk to the other Casita owner but he wasn't that friendly. We were fighting a strong headwind so we decided to stay at Big Creek Campground. These Yukon gov't campgrounds are great! Very nice and clean and lots of squirrels to stalk. We met a very nice couple that were on their way from Edmonton to Whitehorse. They really admired my tail and I got my tummy rubbed. I think it made the woman sad – she misses cats in her life. They gave us some good tips on places to stay and sites to see. They had just come back from house sitting in Thailand. They also have property in Sth America. They have a cat there that is being looked after by the baker that lives in their house. We met another couple from Colorado – the SW part. They had two dogs Daisy and Kiwi that were very nice to me. There was another man from Calgary. They were all going to Fairbanks and touring Alaska but Mum and Dad are thinking that they will stay in the Yukon. There is not a heck of a lot of cell phone coverage in northern BC or southern Yukon and the places we stayed had no internet. Today we are stopped in Caribou RV Park. We had hoped to stay at Wolf Creek but it was full. We will stay at CRV for 2 nights so we can get showers and laundry done. We might move onto Wolf Creek for Monday night if there is room and we haven't done everything we wanted to do in Whitehorse. I started the day by climbing two trees – well I can make it up to about 5 feet which is pretty good for a cat with no front claws. We stopped at the Rancheria Falls Recreation site. Mum and Dad took a short walk to see the falls. Dad got some good pictures but I had to stay in the trailer. Which was probably a good thing because the water was moving quite fast. We all got out at the Continental Divide turnout. There was a huge group of RVs (probably 20 or so) that occupied almost the whole site. We walked around for awhile to let them get ahead of us. Unfortunately we caught up with them at Teslin. Luckily they were all stopping for lunch so we changed our plans a bit. We stopped for a quick lunch and got on the road before that group. We never did see any caribou from the Rancheria heard. Mum and Dad made pizza for supper – it needs a little tweaking in their cooking methodology but they seemed to enjoy it. It was quite chilly at night, Dad got out the tent heater because Mum kept adding more layers. They even turned on the furnace. I snuggled with Mum under the blankets because I was a little cool even with my fur coat. Today was a cleaning and resting day. I climbed 6 trees and met a nice young girl, Katie, the daughter of the owners. She took me for a walk while Mum and Dad had showers and did laundry. Oh, I saw a squirrel when I went for a long walk with Mum and Dad after supper. The only problem with this campground is the howling huskies that arrived yesterday to a lot of fanfare. Mum and Dad went into Whitehorse to see the Yukon Transportation Museum. It has some neat planes and vehicles from when the Alaska Highway was built. The army engineers certainly did not know what they were in for when they were assigned that job. There were mistakes made and the road was rebuilt over the next few years. The World's Largest Weathervane was out front – a Douglas DC3 that had served many years in the Yukon. They also went to see the mammoth and ice-age animal display at Yukon Beringia Interpretive Centre. There was a replica of the Blue Fish Caves near Old Crow – these had the earliest evidence of humans in the new world. There was also an early horse skeleton that had some of the skin still intact. Then it was off to grocery shopping to restock supplies. I hope they brought enough cat food for me ;). We are staying one more day in Whitehorse – hopefully we can move to a new campground for tomorrow night.